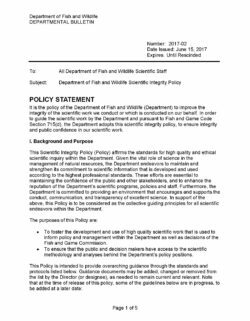 In order to guide the scientific work by the Department and pursuant to Fish and Game Code Section 715(d), the Department adopts this scientific integrity policy, to ensure integrity and public confidence in our scientific work. This Scientific Integrity Policy (Policy) affirms the standards for high quality and ethical scientific inquiry within the Department. Given the vital role of science in the management of natural resources, the Department endeavors to maintain and strengthen its commitment to scientific information that is developed and used according to the highest professional standards. These efforts are essential to maintaining the confidence of the public and other stakeholders, and to enhance the reputation of the Department’s scientific programs, policies and staff. Furthermore, the Department is committed to providing an environment that encourages and supports the conduct, communication, and transparency of excellent science. In support of the above, this Policy is to be considered as the collective guiding principles for all scientific endeavors within the Department. To foster the development and use of high quality scientific work that is used to inform policy and management within the Department as well as decisions of the Fish and Game Commission. To ensure that the public and decision makers have access to the scientific methodology and analyses behind the Department’s policy positions. This Policy is intended to provide overarching guidance through the standards and protocols listed below. Guidance documents may be added, changed or removed from the list by the Director (or designee), as needed to remain current and relevant. 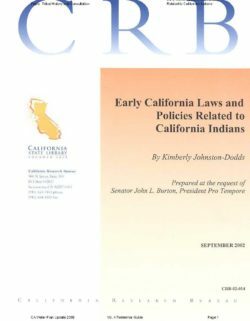 Did the State of California enact laws that prohibited California Indians from practicing their religion, speaking their languages or practicing traditional ceremonies and customs? Senator John L. Burton requested that the California Research Bureau research this question. · Early and current state fish protection laws that exempt California Indians from related prohibitions. The 1850 Act for the Government and Protection of Indians facilitated removing California Indians from their traditional lands, separating at least a generation of children and adults from their families, languages, and cultures (1850 to 1865). This California law provided for “apprenticing” or indenturing Indian children and adults to Whites, and also punished “vagrant” Indians by “hiring” them out to the highest bidder at a public auction if the Indian could not provide sufficient bond or bail. · County-level Courts of Sessions and local township Justices of the Peace determined which Indians and Indian children were “apprenticed” or indentured pursuant to the 1850 Act for the Government and Protection of Indians. · Under the same act, Justices of the Peace, mayors or recorders of incorporated towns or cities, decided the status and punishment of “vagrant” Indians. From 1851 to 1859, the California Legislature passed twenty-seven laws that the State Comptroller relied upon in determining the total expenditures related to the Expeditions against the Indians. The total amount of claims submitted to the State of California Comptroller for these Expeditions against the Indians was $1,293,179.20. The California Legislature also enacted laws during the first fifteen years of statehood that accommodated Indian tribes’ traditional fishing practices. California laws exist today that continue to protect fish and exempt California Indians from related prohibitions. 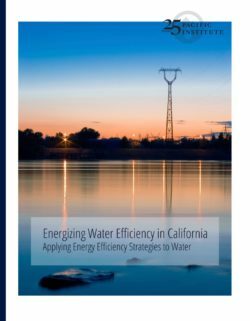 This report identifies key issues related to the economic efficiency of water development, allocation and use in California and discusses general policy changes that might improve economic efficiency. Policy options focus on water pricing, water transfers, water use efficiency (i.e, conservation) and State development and enforcement policies. Analysis is provided at a scoping level of detail. Some important empirical issues that weigh on the relative merits of potential policy changes are not addressed. Efficiency of water use has never been more important in California. There is a need to save water and money. 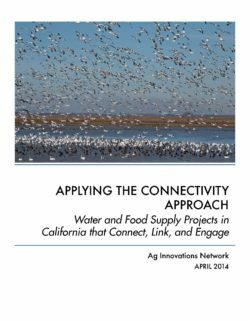 California has recently made progress in improved economic efficiency of water use, but major issues remain. Also, recent changes in the amount and location of supplies suggest a review of allocation efficiency. There are two important efficiency topics that this paper does not address in detail. First, economic efficiency of water use for ecosystem purposes is a viable concept, but it is difficult to apply given the state of Delta ecosystem science and the current range of possible futures. We can not quantify the relationship between water and ecosystem functions and values. Therefore, our ability to prescribe efficiency changes related to Delta water for ecosystem purposes is limited. Second, this paper also does not address the economic efficiency of major new storage or Delta conveyance facilities. The efficiency of specific water supply projects including regional or local conjunctive use and groundwater storage projects are also not considered. These are being addressed in different forums. 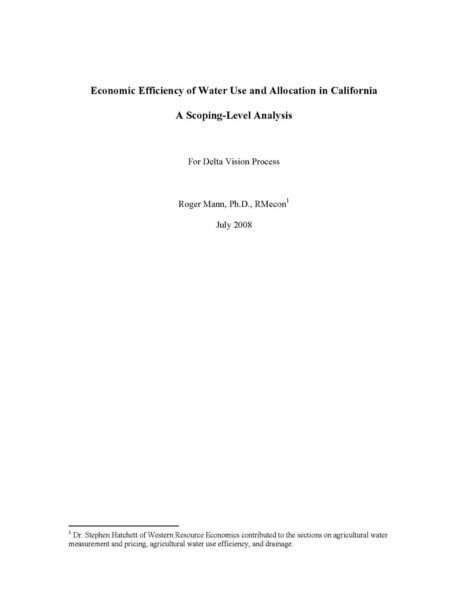 • Are water allocations under California’s water rights systems efficient? • If there are inefficiencies, could an effective water transfer market increase efficiency? • Are there barriers or constraints to water transfer markets that should be removed? • How could water pricing be changed to increase efficiency? 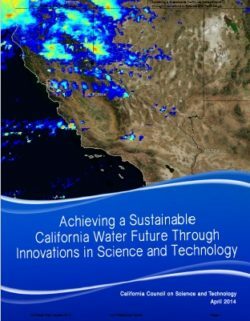 • How could California encourage efficiency in the use and development of water through incentives such as grants and loans, and through enforcement? In all cases, our findings represent potential improvements from the perspective of economic efficiency alone. There are usually other, non-economic considerations which would play into the larger question of the laws and policies that might be changed. In California, we have spent over a century and billions of dollars to preserve and protect the environment for current and future generations. The EJ movement asks us to put real people in that environment, particularly the most vulnerable populations such as ethnic minorities, low-income persons, the young and the elderly. In a nutshell, EJ can be said to be the vision and process of creating socially just, sustainable human and ecological systems, where all participate fully in decisions affecting their lives. The Governor’s Office of Planning & Research (OPR) assists the Governor and the Administration in land use planning, research, liaison with local government, small business advocacy, rural policy, and various interagency taskforces. 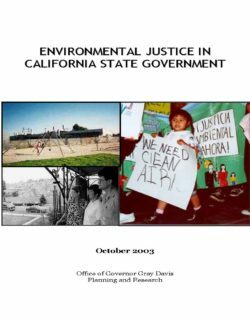 1999 legislation defined EJ in California law and also established OPR as the coordinating agency in state government for environmental justice (EJ) efforts. The placement of the central EJ program within OPR demonstrates the Legislature’s understanding that EJ efforts require coordination at the highest level of state government. Indeed, California is the only state that has placed its EJ effort within the Chief Executive’s Office. The legislation establishing OPR as the “coordinating agency in state government for environmental justice programs” (California Government Code § 65040.12) directs the OPR director to consult with state agencies and interested members of the public and private sectors in this state, coordinate its efforts and share information regarding EJ programs with federal agencies, and review and evaluate any information from federal agencies that is obtained as a result of their respective regulatory activities. This policy report is intended to provide a brief history of EJ, report on the status of OPR's efforts, and provide an outline of EJ findings, goals and policies for future EJ efforts within state government. Much work remains to ensure that the most vulnerable of Californians, including people of color and low-income persons, are treated with dignity and respect regarding environmental decisions. OPR views its work thus far as a modest, although significant beginning. 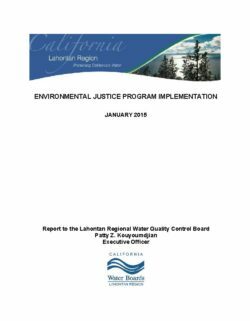 The Lahontan Regional Water Quality Control Board (Lahontan Water Board) reviewed how environmental justice (EJ) is conducted in the region and examined new ways to improve our efforts to benefit the disadvantaged communities in our region. The challenges faced by disadvantaged communities (DACs) in the Lahontan region are unique and often different than other DACs in more urban regions. This report provides an assessment of existing efforts to help DACs and catalogs EJ concerns. In addition, the report includes recommendations to enhance DACs participation in the regulatory process, expand access to funding and technical assistance, and improve water quality and drinking water. 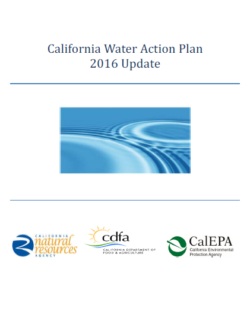 This report details the progress that the California Environmental Protection Agency (CalEPA) and its boards, departments, and office (BDOs) have made from summer 2013 to the end of 2015. By law, CalEPA is required to prepare a report to the Governor and Legislature every three years on the activities it has undertaken in achieving the objectives identified in the Intra-Agency Environmental Justice Strategy. 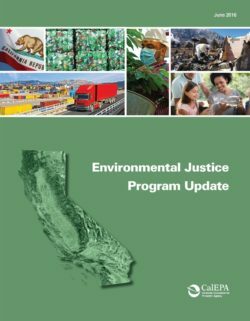 The first section of this report provides updates on significant environmental justice legislation passed in California since 2013. The second section of the report provides updates on CalEnviroScreen, the Environmental Justice Compliance and Enforcement Working Group, and the Environmental Justice Small Grant Program. The third section describes the BDOs’ community partnership with the Identifying Violations Affecting Neighborhood (IVAN) tool. Finally, the fourth section provides an account of the environmental justice accomplishments and goals of the Agency’s BDOs.